Trincomalee and Ampaa'rai, two of the three districts in the East, are long subjected to systematic Sinhala-Buddhicisation. Although the district of Batticaloa is facing structural occupation across the interior villages that border with Polonnaruwa and Ampaa'rai districts, the supremacist Sinhala Theravada Buddhist establishment and the unitary state system were unable to make headway for Sinhalicisation agenda in the urban areas of the district. However, two Sinhala monks have been experimenting with different tactics to achieve that agenda in the city and its suburbs after the end of the genocidal war in Vanni in 2009. 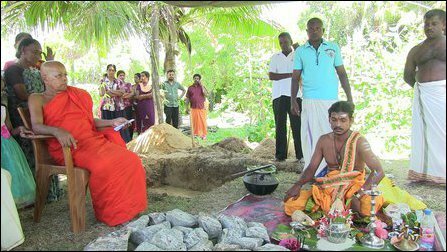 The latest experiment seeks to deceive Tamils through accommodating two Hindu temples within the Sinhala Buddhist monastery establishment which is being expanded with a Vihara at “Jayanthi-pura,” 5 km northeast of the city where no Sinhala people reside. Ampitiya Sumanarathana Thera from the Sri Mangalaramaya vihara in the city is well-exposed through his verbally abusive and violent attitude for a long time. He was involved in the anti-Muslim pogroms in 2018. However, Sanganayada Panditha Paddapola Gunananda thera, who is based at the suburb, wants to suppress objections coming from Tamils by deceiving them through accommodating two minor Hindu temples within his monastery complex. The move is also branded as ‘reconciliation’ while the agenda behind is entirely different, grassroots Tamil activists in the city said. A Tamil businessman known as Aagnchaneayar Shanmugarajah is funding the construction. Aagnchaneayar (the monkey god that helped Rama to conquer Ravana) is a non-Saivite deity, which originates from the North Indian Vaishnavism. 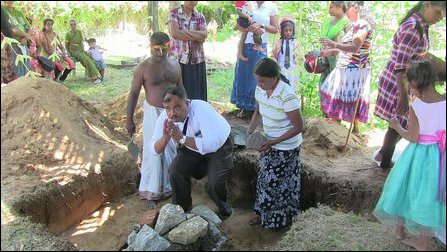 The foundation stone-laying ritual was conducted by Jegatheeswara Sharma, the priest of Batticaloa Aagnchaneayar temple. Divisional Secretary of Ma'nmunai North, M Thayaparan, and some Tamil public servants were also present along with a few Tamil villagers. Buddhist temples having folk deities of Hinduism is not a new trend. Sinhala Buddhists in the South also worship the folk deities. However, the ultimate motive and how the agenda is being thrust upon the Tamil people by the extremist sections of the Sinhala monks are causing concerns, the Tamil activists commented. If the monk was promoting reconciliation across religions, would he also come forward to establish a small mosque and a church within the premises, the activists asked. 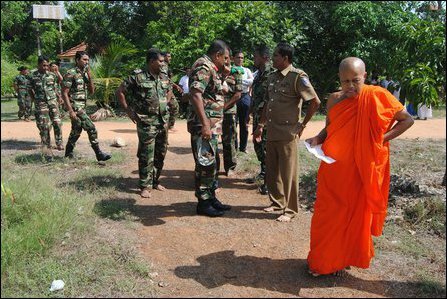 Both the monks, Ampitiya Thera in the city and Paddapola Thera in the suburb, also seek to trick the Tamils against the Tamil-speaking Muslims, who are the next target facing negation of territoriality by the Sinhala-Buddhist establishment, the activists further observed. Even the so-called reconciliation model of the LLRC outlook seeks to remove the territorial claims of other historical people in the island. None of the districts in the island should have a different religious or linguistic identity to what the extremist sections of the Sinhala Theravada-Buddhism want to establish as the mainstream ‘island-wide’ identity, finds its political space in the so-called ‘Sri Lanka’ model of reconciliation. Paddapola Gunananda is pre-occupied with the construction of what he wants in the future as the Sinhala Buddhist monastery at Jeyathi-pura. 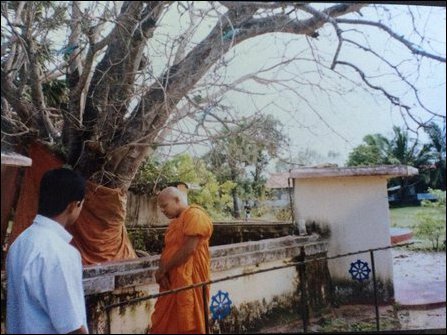 Before the war intensified, there was a small place of Buddhist worship with a Bo tree at Jeyanthipuram, which the monk now claims as an ‘ancient’ Sinhala village. Around 25 families, most of them from Matara had settled there for fishing, before the times of war. The migrant Sinhala fishermen were having a Vaadi (fishing hut area) in the city as well. It was popularly known as ‘Sinhala Vaadi’. A small community of Sinhala fishers were also settled in Ka'luvang-kea'ni. No Sinhala-Buddhists are living in the village at present. Paddapola Thera has been unsuccessful in convincing Sinhalese to join him at the locality as settler colonists. However, the monk is determined to find creative ways to suppress Tamil opposition to bring Sinhala settlers. “If there are monks who really want to promote reconciliation, there are other ways of approaching the Tamil-speaking people. 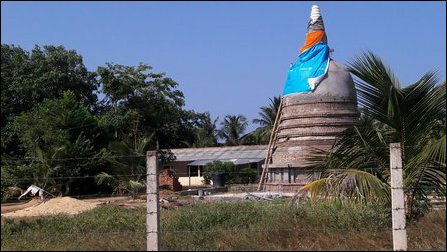 The Sinhala monks with powerful institutions could come forward to reconstruct at least some of the demolished Hindu temples in the district. There 113 temples that have been demolished. However, these two monks are not prepared to approach reconciliation that way,” a councillor who didn't wish to be named, told TamilNet. In 2011, during the regime of Mahinda Rajapaksa, SL Higher Education Minister S.B. Dissanayake laid the foundation for the 'Sama Chatiya'. The Dharma Shalawa building was reconstructed in July 2015. The monk has been staying at the locality with two Sinhala policemen providing security to him. 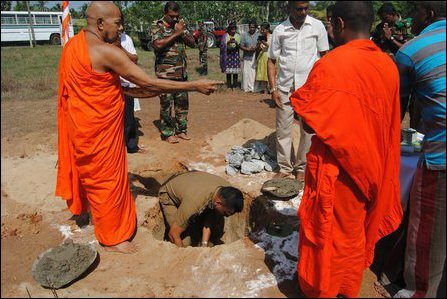 The monk was able to mobilise for the construction of the Vihara following the regime change in 2015. 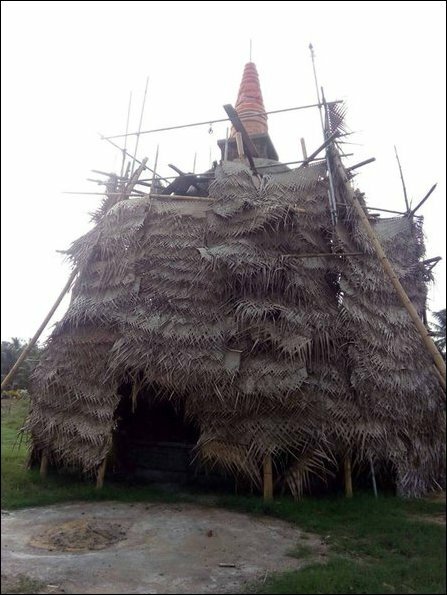 Two years ago, in 2016 August, Paddapola Gunanada attempted to woo Sinhala settlers by campaigning that a Buddhist centre was functioning at Jayanthipura starting from 1956 and that there was a big Sinhala settlement named ‘Vijayapura’, which he wanted to recreate. The average Sinhala people didn't show much interest in moving back into the locality. The foundation stone for Vihara was laid in July 2017 and the structure of the Vihara was complete by October 2018.